The extra festive ‘Big 3-Oooh!’ Scala Fair is nearly here and it promises to be a fantastic edition. To mark the 30th anniversary of the fair, Scala Playhouse is going all out with offers, deals and not just one, but two whole night of fantastic entertainment. “Yes, you read that right: two whole nights of entertainment. And the best news? You’re all invited! This ‘Big 3-Oooh!’ Scala Fair we’ve got something extra special planned for your nightly entertainment. On Sunday the 12th of March, we are organizing a spectacular ‘Casino Night’ where customers can win fantastic prizes. This fun, playful and social event allows you to score yourself some fantastic rewards, whilst enjoying the festive atmosphere and great hospitality. 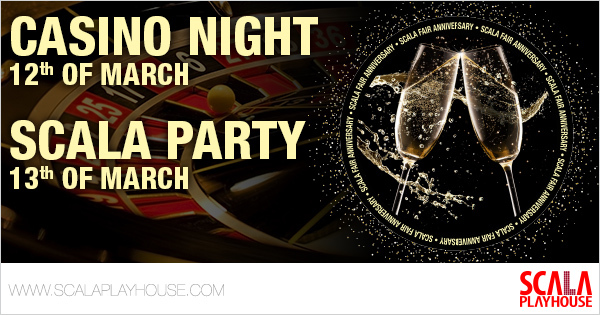 The famous Scala Party will be held on Monday the 13th of March – making room for the ‘Casino Night’ on the 12th. Join us to gamble, laugh and dance the night away on the 12th and13th of March; and raise the glass together to mutual successes,” the company states. The amazing evening program is just one aspect of the Scala Fair. During the day the showroom – which is transformed into a festive wonderland with unique decorations – will open its doors from 9am to 6pm to welcome guests. Retailers can chat to representatives from well-known brands about their latest products, go wild in the Cash & Carry, get introduced to new releases, take advantage of the festive offers, win rewards in prize-competitions and enjoy Scala Playhouse’s hospitality on the showroom floor and in their showroom restaurant.